We apply the moment analysis technique to analyze large scale simulations of the Zhang sandpile model. We find that this model shows different scaling behavior depending on the update mechanism used. With the standard parallel updating, the Zhang model violates the finite-size scaling hypothesis, and it also appears to be incompatible with the more general multifractal scaling form. This makes impossible its affiliation to any one of the known universality classes of sandpile models. With sequential updating, it shows scaling for the size and area distribution. The introduction of stochasticity into the toppling rules of the parallel Zhang model leads to a scaling behavior compatible with the Manna universality class. 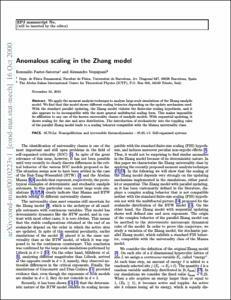 Pastor-Satorras, R., Vespignani, A. Anomalous scaling in the Zhang model. "European physical journal B", 4 Octubre 2000, vol. 18, núm. 2, p. 197-200.